These are the words of Raj Sharma, entrepreneur but foremostly a visionary of public sector effectiveness. He strongly believes that, because governments around the world are the custodians of 10 trillion dollars which are not being spent efficiently, public procurement has the power to influence change at scale, for those who need it the most. He has accumulated 15 years of being entrenched in public procurement (or government contracting as some may call it), policy and networks, and during this time has built up the expertise and motivation to make a difference. “Even if we could improve the effectiveness of a small proportion of that spend, it could do a lot of good to a lot of people, and I believe create a better world for everyone,” he told us. Multinational institutions (the World Bank included), he observes, have been working at it, but it isn’t enough to make a difference at scale. Procurement, however, as we know, touches everything in an organisation, and likewise, touches on everything in government, whether that be outsourcing, finding the right innovators to partner with, drawing on the right expertise to help take on the challengers of health care, infrastructure, or public services – all the areas that have a direct impact on people. As well-intended as the policy frameworks that come out of central government or multinational institutions are, he believes they don’t take into account the need to eliminate bureaucratic complexity in order to drive meaningful change, resulting in more complexity and therefore the same ongoing problems. The public sector, he believes, doesn’t have the stability in the same way the private sector does. Companies can look at strategic transformation through the eyes of a 5- or 10-year plan, but not so in the public sector. Most political cycles run between 2 and 5 years and leaders inevitably are driven by special interests and party politics. Suffice to say, the real power to drive change comes from those at the coal face. 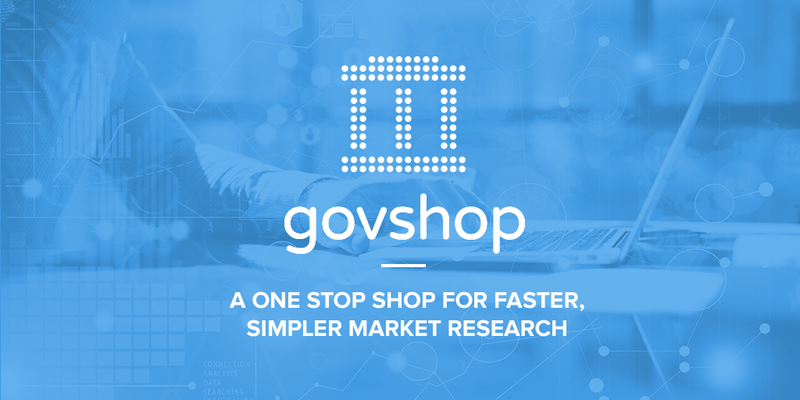 This is the whole idea behind GovShop – democratising market and supplier information, giving it away for free, arming people with the tools to drive a change in thinking – in GovShop’s case, this is in finding the right partners with like-minded ambitions. 1 Lack of time – government market research, and the funding required to train to do it well, is not treated as a critical aspect of public procurement. Complying with rules and ‘paper pushing’ takes precedence over spending time on more high-value tasks, like searching for and engaging with suppliers. Time is one key issue and people don’t have enough of it. 2 Fast changing markets – by nature this applies to both the public and private sectors. From what he’s seen, government doesn’t have a defined role for market research. Where people might have a responsibility to build contracts, work with customers and manage supplier relationships, they aren’t necessarily monitoring the market at all times. The market is moving, and as suppliers enter and leave it, it’s impossible for someone to keep track of it all. 3 Data fragmentation – even if they had the time to do the market research and keep an eye on market movements, the fact is, data around suppliers, in terms of who is out there, what they do, their experience and real credentials, including certifications for the critical regulations governments may have, is patchy. While some open data sources exist, many are incomplete, often with surface-level information that is not useful towards qualifying and selecting suppliers. To help drive this initiative forwards, Raj would love to hear your views on what you believe are the core public sector issues in Europe – how do they affect you? What are you experiencing? What would you like to see happen to help resolve them? Please leave your comments, or email us via our ‘contact us’ page. “… to drive long-term sustainable change ... to create an open, efficient and innovation-driven public sector market, so we can help government and suppliers better work together to solve problems, use our taxpayer money in the best manner possible, and ultimately improve the lives of citizens around the world." *New research from TheyBuyForYou partner Openopps shows public tenders across Europe are becoming increasingly uncompetitive with 25% of tenders receiving only one bid. Of concern, is that the trend toward uncompetitive single-bid tenders is increasing, up by 44% between 2016 and 2017. The total estimated value of these uncompetitive contracts has grown from €41trn to more than €100trn in the same period. Government markets are not only one of the most closed in the world with significant barriers to entry, but they are also seriously uncompetitive, with public procurement contracts often handed out to the Select Few on a preferential basis. What’s more, it is the ill-considered policies of previous governments, including that of Tony Blair, that exacerbated the problem of concentration in the UK economy. Consider the market in defence equipment for the Armed Forces. Unlike the market in consumer goods and services, there is only one customer for defence equipment – the government. Consequently, the purchasing decisions taken by the government has a significant bearing upon the composition and diversity of players in the defence equipment market. And because taxpayers money is used by the government to procure military equipment for the Armed Forces, the condition of the defence equipment market should be of concern to anyone who has an interest in the proper functioning of open and free markets, and in securing best value for money, as it relates to the expenditure of public funds. Nowhere is the market in defence goods more concentrated than in the naval shipbuilding sector, as exemplified by the number of bidders who entered the competition to build the Type 31e general purpose frigates for the Royal Navy. It is the first time that a contract for combat ships has been competed openly on the global market, to identify the bidder that will construct the five Type 31e frigates. Hitherto, the contractor to receive such a single-source design and build contract has always been selected on a preferential basis (from the Select Few) – by successive generations of people in the pay of the State who have a poor understanding of how free markets work, not least, because they have not spent a single day of their lives in the private sector. The consequence of this misguided attempt at shaping the shipbuilding industry has been an unmitigated disaster. Only three industry teams have responded to the (second) announcement to submit an expression of interest for consideration by the procuring authority, the Ministry of Defence – this, after the government went out of its way to relax the demanding technical specification requirements incorporating stringent naval standards, specifically to attract commercial shipyards. A minimum of seven bidders are required to run the winner-takes-all competition efficiently. See this illustration pic.twitter.com/RUToAZ6thx. It may be that foreign companies do not believe the government’s word when it says that it will run a genuinely fair competition open to all-comers, including offshore yards – only to then surreptitiously favour domestic contractors, as has happened so often in the past. BAE Systems then went on to use this dominant market position to stifle competition and coerce the Brown government into signing a 15-year Terms of Business Agreement* in secret which, in effect, hands out a series of cost-plus, naval shipbuilding contracts worth £3,450 million up to 2024. In so doing, future governments have been denied freedom of manoeuvre in the management of public finances.